William Marquardt is an archaeologist who specializes in the ancient cultures and environments of south Florida. Since 1983 he has focused on the ancient Calusa Indian people who inhabited present-day Charlotte, Lee and Collier counties. This approach, in which the past environment is studied along with ancient people, is called historical ecology. Marquardt’s work requires much effort from foundations and volunteers and since 1987 hundreds of residents and tourists have taken part in supervised excavations, lab work and environmental data-gathering. Since 1988, he has received $4.8 million in research funding. 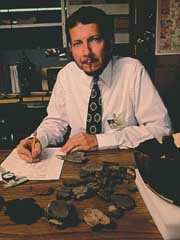 Marquardt is director of the Randell Research Center, a research and education facility located at an important Calusa archaeological site at Pineland. He is also curator of the new Hall of South Florida People and Environments in the Florida Museum of Natural History’s exhibition center at Powell Hall.